Play through X amount of days to unlock listed track in arcade mode. Acura HSC '04 Win Type R Meeting at Honda in the Japanese Showroom. Alfa Romeo Giulia Sprint GTA 1600 '65 Win GTA Cup at Alfa Romeo in the Italian showroom. Alpine A110 1600S '73 Win Renault Alpine Cup at Alpine the in the French Showroom. Aston Martin DB9 Coupe '03 (Super Gold - Special Color) Win Aston Martin Carnival at Aston Martin in the British showroom. Audi Le Mans quattro '03 Win Tourist Trophy at Audi in the German showroom. Audi Pikes Peak quattro '03 Win A3 Cup at Audi in the German showroom. Chevrolet Camaro IROC-Z Concept '88 Win Camaro Meeting at Chevrolet in the American Showroom. Citroen 2CV Type A '54 (Peche - Special Color) Win 2HP - 2CV Classics at Citroen the in the French Showroom. Clio Renault Sport Trophy V6 24V Race Car '00 Win Clio Trophy at Renault in the French Showroom. Honda MUGEN MOTUL CIVIC Si Race Car '87 Win Civic Race at Honda in the Japanese Showroom. Hyundai Clix '01 Win Hyundai Sports Festival at Hyundai in the Korean Showroom. Isuzu 117 Coupe '68 (Special Color - Maple Orange) Win Isuzu Sports Classics at Isuzu in the Japanese Showroom. Lotus Elan S1 '62 Win Lotus Classics at Lotus in the British showroom. Lotus Elise Type 72 '01 Win Elise Trophy at Lotus in the British showroom. Mazda 110S (L10A) '67 Win Club "RE" at Mazda in the Japanese Showroom. Mazda MX-Crossport '05 Win NR-A Roadster Cup at Mazda in the Japanese Showroom. Mazda RX-8 Concept LM Race Car '01 Win NR-A RX-8 Cup at Mazda in the Japanese Showroom. Mercedes-Benz CLK Touring Car '00 Win Legends of the Silver Arrow at Mercedez-Benz in the German Showroom. Mercedez-Benz 300 SL Coupe '54 Win SL Challenge at Mercedez-Benz in the German Showroom. MGF '97 (Yellow- Special Color) Win the MG festival at MG in the British showroom. Mistubishi Lancer 1600 GSR Rally Car '74 Win Evolution Meeting at Mitsubishi in the Japanese Showroom. Mitsubishi i '03 Win Mirage Cup at Mitsubishi in the Japanese Showroom. NIKE One 2022 Win Saleen S7 Club at Saleen in the American Showroom. NISMO GT-R LM Road Going Version '95 Win Race of the Red "R" Emblem at Nissan in the Japanese Showroom. Nissan 240ZG (HS30) '71 Win Club "Z" at Nissan in the Japanese Showroom. Nissan mm-R Cup Car '01 Win March Brothers at Nissan in the Japanese Showroom. Opel Calibra Touring Car '94 Win Speedster Trophy at Opel in the German showroom. Peugeot 205 Turbo 16 Rally Car �e85 Win 206 Cup at Peugeot in the French showroom. Renault AVANTIME '02 (Special Color - Jaune) Win Megane Cup at Renault in the French Showroom. Shelby Mustang G.T. 350R '65 Win Shelby Cobra Cup at Shelby in the American Showroom. SILEIGHTY '98 Win Silvia Sisters at Nissan in the Japanese Showroom. Subaru IMPREZA Super Touring Car '01 Win Stars of Pleiades at Subaru in the Japanese Showroom. Subaru SUBARU 360 '58 (WR Blue Mica - Special Color) Win Subaru 360 Race at Subaru in the Japanese Showroom. Suzuki CONCEPT-S2 '03 Win Suzuki K-Car Cup at Suzuki in the Japanese Showroom. Suzuki GSX-R/4 '01 Win Suzuki Concepts at Suzuki in the Japanese Showroom. Toyota ALTEZZA Touring Car '01 Win Altezza Race at Toyota in the Japanese Showroom. TVR Cerbera Speed 12 '00 (Chameleon - Special Color) Win Black Pool Racers at TVR in the British showroom. Volkswagen Beetle 1100 Standard (Type-11) '49 Win Beetle Cup at Volkswagen in the German Showroom. Volkswagen Golf I GTI '76 Win GTi Cup at Volkswagen in the German Showroom. Volkswagen Karmann Ghia Coupe (Type-1) '68 Win Lupo Cup at Volkswagen in the German Showroom. Triumph Spitfire 1500 '74 (Special Color- Maroon Metallic) Win the Spitfire Cup at the Triumph dealer. Win the Gran Turismo World Championship in Professional Hall. If you look really close on the side of the Nike One, you can see a small area near the front of the car of morse code. If you go into photo mode, this will become clearer. The morse code is written backwards as to be seen correctly from inside the car. Spelled out, it is " www.Phil-Frank.com " the website of the Phil Frank Automotive and Product Design Company. 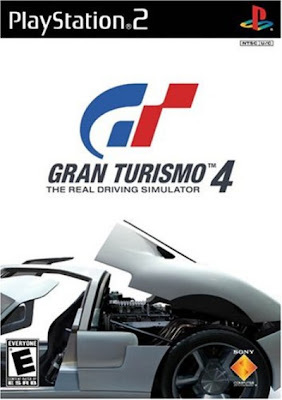 Phil Frank was paid to design the futuristic Nike car specifically for Gran Turismo 4. When you buy or win a new car, take it for an oil change. After the oil change, your car's horsepower will increase. To get a Blue (acceleration) and Red (brakes) Licence Test Guide simply push R3 during 3,2,1,Start. It shows you the best route to go and where to start braking. This only works on the B and A license tests and tests where there is no pace car. To speed up your replays simply press down L3 and to turn off the background music simply press O. When using the automatic transmission option, hold R2 to make your car remain in the same gear. This is great for remaining at a given speed through a corner, or stretching the top end of a gear for a little extra speed/performance.